Hi, friends welcome to day 2 of the 2017 Fall Blog Hop where we are celebrating all things fall! I’m so thrilled to join 17 other talented bloggers to bring you a week of fun fall inspiration. You can kick off the Hop with Deanna over at Mirabelle Creations! Our host and master of the pen! Then make your way through to Giggle Home Furnishings. Lori finished up our first day with lots of easy ideas for outdoor entertaining in Fall. I love how she makes it so effortless! Now it’s my turn and I’m so happy to share with you my neighborhood beer tasting party. For those that follow me, you’ll know my family recently moved to Portland. The kids have just started school and David and I are getting out and meeting the neighbors. I’m totally inspired by Portland, it’s a fantastic city and boy do they love their craft beer! So, I figured a neighborhood beer tasting party might just be the perfect way to have fun with and get to know our new neighbors better. Let me share my tips for hosting a fun fall-inspired beer tasting party for your friends and neighbors! Blind Taste – Create a blind taste experience for your guests. “Brown (or black)” bag it! – hide that beer from sight and label it. My lovely friend Jen of Jen T by Design created the cutest (yet masculine!) labels to number our beers and you can download your free copy HERE. I also added the numbers in the glass circle spaces on the beer trays. This meant I could pour the beer taster and everyone remembered the number they were tasting. Rate – As your neighbor’s taste each beer provide a rating card so they can rate the beers for looks, aroma, flavor, and finish. This is great for those learning about beer tasting and also for those looking to remember their favorites next time they are buying. Reveal – Surprise! How close were your neighbors to picking the qualities of each beer?! You can fill in this card to hand out after tasting is done. For this first neighborhood beer tasting party I kept it to snacks – bags of popcorn, pretzels, and peanuts. We also served a few more significant items like hot dogs, bread pretzels, and french fries. All the perfect accompaniments to craft beer. Easy & social items so you can focus on getting to know the neighbors. Jen made the cutest labels for the food, they look just like beer caps! I love beer tasting trays, I was hooked the first time I saw them in one of breweries downtown. I found a cost effective plain pine option online and spray painted it a glossy black. I then added the 2-inch numbers into each circle (1-4) space. I wanted each table setting to be quite masculine, I’ll have my girlie party later! this is for hubby (insert awwww good wife here! Lol!)! I used a junk store (treasure) finds as a placemat, black plates with bamboo plates layered on top and black cutlery. Kraft paper was a quick and easy table runner to complete the look. I then added black napkins with blue bands to soften the look and fun gas store attendant name tags as place names. I found the biggest selection at a local vintage store, it was so rewarding hunting and finding the names I was looking for. The final details, the card for tasting notes ( I just adore this entire set of printables by Jen T By Design), a pen and a pumpkin! To get everyone into the spirit of the beer tasting ask everyone to bring along a six-pack of their favorite beer. Split out the beers so that everyone takes home 6 new beers to taste at home. I bought kraft paper six packs and Jen created a fun label I stuck onto each one. Good Beer & Good Times! Yasss! Ask everyone to fill out a tag to add to each beer with their name and the reason they chose that beer. You are done! They will remember this party for a few more drinks to come! Then ask everyone to fill out a tag that you can add to each beer – include their name and the reason they chose that beer so you can let them know what you thought. They will remember this party for a few more drinks to come! Do you want to start a tradition? Something that your neighbors can always bring along to your annual event? Try a fun stein! I found these vintage black steins which are perfect for fall at a local junk store for under $4 each! They are so unique and interesting. I can’t think a better way of starting a club or tradition than a personal drinking vessel! Add these super adorable tags from Jen T By Design and you are golden! If you have a Cricut® these will cut beautifully. 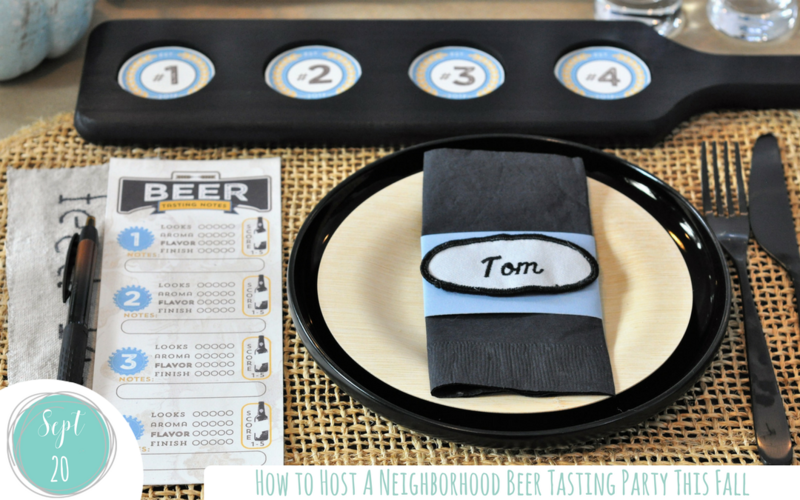 I hope you enjoyed my neighborhood beer tasting party and get inspired to mingle with your neighbors this fall. Don’t forget to download your free printable from Jen T By Design HERE and visit her shop for the full range of neighborhood beer tasting party printables, including designs that can be cut using your Cricut®! Next please join my friend Sarah of Sarah Sofia Productions next for a delicious Moscow mule recipe to spice up this fall. Trust me, this lady is awesome! it will be a treat. Holy heck YES! I can totally get behind this party! This is SO FUN, Natalie! Cheers! I LOVE this party!! What fun inspiration for a gathering!! This is such a fun party idea and a great way to get to know the neighbors. Even if you don’t drink (like me) there are so many items you could use for a tasting. You could even do a craft soda taste test! Although it would have to be much less serious!! Jen did a fabulous job on the printables. Nice table lady! You did a great job. Natalie this is such a cool and creative idea!! Perfect for a guys party too.